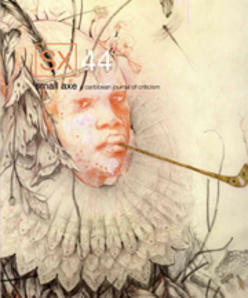 Published three times a year since 1997, and now available in both print and online versions (this review is based on the print), Small Axe brings together writings from around the world concentrating on Caribbean studies, and presents them in a beautifully realized, imaginative format. Recent issues illustrate the variety of coverage on a focused subject, with articles such as, “Bleeding, Wailing, and Hypnosis: the Words and Images of Caroline “booops” Sardine,” “From Aesthetics to Allegory: Raphael Confiant, the Creole Novel, and Interdisciplinary Translation,” “Making Jamaican Love: Colin Channer’s Waiting in Vain and Romance-ified Diaspora Identities,” “Assemblages of Experts: the Caribbean Court of Justice and the Modernity of Caribbean Postcoloniality,” and “Gazing Outward and Looking Back: Configuring Caribbean Visual Culture.” Different issues include special sections on Translating the Caribbean, Caribbean Historiography, and Visual Life of Catastrophic History, comprising thematic collections of essays and visual renderings of art works and photographs organized around a motif or motifs. Periodically, poetic works and short fiction pieces that have won Small Axe’s Literary Competitions are showcased in an issue. Authors and creators here come from the arts, academe, and the professions (writing, architecture, journalists), and the journal encourages submissions of fiction, non-fiction, poetry, interviews, visual art, and book discussions. Anyone seriously interested in the study of or in experiencing Caribbean culture will want to access this work, and libraries serving such students will want it for their collections.